Jennifer Silverberg Executive chef Chris Kramer: Were a bunch of kids trying to put out the best food we can. 10935 Manchester Road, Kirkwood; 314-821-2277. Hours: Lunch 11 a.m.-2 p.m. Tue.-Fri.
Dinner 5-10 p.m. Tue.-Thu., 5-11 p.m. Fri.-Sat. On a chilly Tuesday a few weeks ago, most of you settled into your armchair or a stool at your favorite bar or maybe even a seat at Busch Stadium to watch Game Three of the World Series. About the time of the first pitch, my fiancée and I arrived for dinner at an otherwise empty Trattoria Two. You watched Chris Carpenter toss a masterpiece, eight shutout innings that tipped the series in the Cards' favor. I ate lobster ravioli in a cream sauce spiked with fresh vanilla and Pernod. I bet I enjoyed my evening more. The homemade ravioli were fat with succulent lobster meat, and the rich, sweet sauce  not to mention the two plump pieces of buttery claw meat standing upright in the center of the plate, beckoning  pushed the dish toward overwhelming indulgence. Holding it in check were pieces of walnut and chopped fresh chives scattered over the plate. The chives offered a bright, sharp contrast to the ravioli and the sauce, while the walnuts provided a mellow undertone and some crunch. A bed of sautéed Swiss chard propped up the claw meat and pulled the dish together; it was almost as buttery as the ravioli and sauce but retained some of the earthy bite of the chives. If I didn't literally swoon while I ate this, I definitely did once dessert arrived. On one side of the plate was a thick piece of pumpkin bread  like a pumpkin cake, really  topped with a luscious caramel panna cotta. This by itself would have been fantastic, a pairing of classic autumn flavors. But between the bread and the panna cotta was a very thin layer of sea salt flakes. At first I was dubious: Dessert should please your palate, not slap it back to attention. Then I noticed how the salt heightened the contrast between the savory pumpkin bread and the toasty sweetness of the panna cotta. Then I got it. The caramel panna cotta and pumpkin bread were like two halves of a perfect fall day: cool in the sunlight, cozy at night. But the sea salt was bracing, like those sudden gusts of wind in late October that remind you winter will be here sooner than you expect. It could have been a metaphor for dessert itself  that last sweet taste of luxury before you return to your life. As I said, this was just one side of the plate. On the other side, on a bed of whipped cream, was a large, thin "oatmeal lace cookie," its top curve covered with a shell of dark chocolate. This might be overkill, I thought as I devoured the last delicious bite. Get this: Pastry chef Andrew Burris is still a student at L'École Culinare. If he doesn't get an A, they should shut the school down. In addition to the caramel panna cotta and pumpkin bread, his cheesecake (a blend of ricotta and mascarpone drizzled with lavender honey) and tiramisu were remarkable, as savory as they were sweet. It was like having a cheese and dessert course at the same time. Burris isn't the only youngster at Trattoria Two. 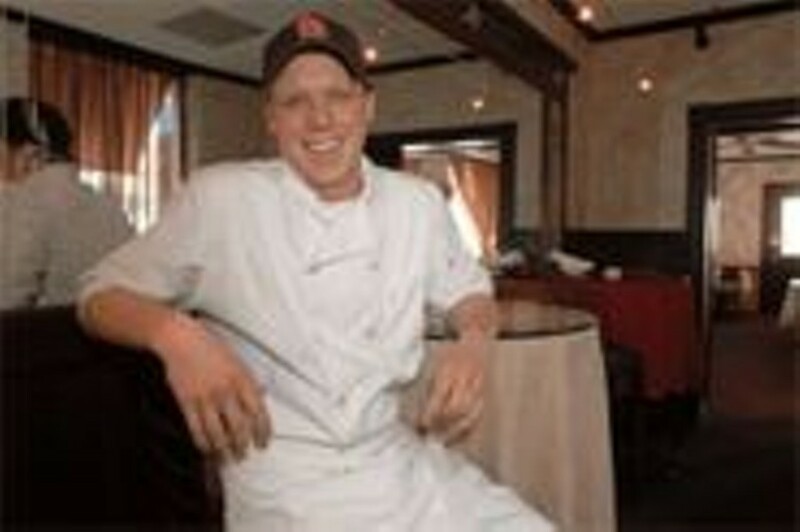 In a phone interview, owner and executive chef Chris Kramer told me he (Kramer) is the veteran of his staff  at age 27. "We're a bunch of kids trying to put out the best food we can," Kramer says. Kramer may be young, but he has been around the restaurant biz his entire life. In 1974 his father opened Two Nice Guys, an Italian restaurant in the usual St. Louis style. "Ever since I was a kid," Kramer says, "it was my dream to buy it." Kramer's father decided to sell Two Nice Guys outside the family after a spell of heart trouble a few years ago. Kramer, meanwhile, was working his way up the kitchen ranks while studying at the University of Missouri and wedging in a certification program at the Culinary Institute of America in Hyde Park, New York. This year Kramer and his wife were able to reacquire the original Two Nice Guys, a modest building on Manchester, west of Lindbergh. They opened the lower level as Two Nice Guys, serving pizza and other casual fare. The main level became Trattoria Two. Trattoria Two's décor is simple but flattering. The gold-tinged walls and modern sconces create a warm atmosphere, while heavy curtains obscure the view of a dowdy stretch of suburban retail. Something about the place still feels old-fashioned, though. Little touches, mostly, like the dish of Andes chocolate mints near the door, or how, on my first visit, the hostess draped my fiancée's napkin across her lap for her, but not mine or our (male) friend's. And our waiter, Carl, was the sort of waiter's waiter you rarely find in new restaurants. At first glance the menu might seem old-fashioned or, worse, conventional. Pastas and grilled meats. Fried calamari (of course). But the ingenuity and skill of Kramer and his staff elevated nearly everything I tried  or made up for its shortcomings. Take the fried calamari, for instance. Kramer coats them with ground pistachios as well as a more traditional breading and serves them with a "salsa verde" of puréed basil. The result is tender, flavorful and surprisingly light  provided you don't scarf down the entire plate yourself. An appetizer of fried artichoke cakes with a ragu made from large chunks of tomato and sausage successfully blended many tastes and textures at once: salty, sweet, tangy and savory; creamy and crunchy. The pastas were uniformly excellent  though nothing could top the lobster ravioli. I loved the toasted almond/brown butter sauce that glazed a dish of gnocchi and root vegetables, and the "fettuccini tutto mare," which featured a bountiful mix of shrimp, scallops, pancetta, tomatoes and mushrooms in a nicely understated cream sauce. Even the simple thick spaghetti noodles in cream sauce that accompanied a dish of veal Parmesan were satisfying. Veal Parmesan was distinguished by what it wasn't: overcooked or smothered in broiled cheese. The three scallops of veal  coated with coarse bread crumbs and served in a mildly spicy marinara  were exceptionally tender. Osso buco didn't fall off the bone as easily as you might like, but it came with its traditional (but increasingly rare) accompaniment of gremolata, a garnish of minced orange and lemon peel, parsley and garlic. Kramer added sprigs of fresh mint  a clean note that helped spark a dish that, served with mashed potatoes and lentils, might have been too heavy, even on a chilly night. My favorite entrée was "honey-brined chicken." The crisp skin and the juicy breast meat were sweet but not too sweet and had a nutty undercurrent; accompanying it was a fantastic pumpkin orzo and roasted beets. "Filet and crab" was certainly the most audacious entrée: a six-ounce filet with a large dab of Boursin on top; atop the cheese were chunks of Alaskan king crab and a smattering of crumbled bacon. I wanted to like this dish. The filet was meltingly tender, the crab delicately sweet. The Boursin overwhelmed both, though. I wonder if Kramer chose a cheese so lacking in subtlety because  as with the osso buco  he wanted to cut through the heaviness of the mashed potatoes that accompanied it. Mashed potatoes accompanied four out of the nine entrées available on my visits. If anything is holding Trattoria Two back, it's this inclination toward the popular or easy choice. Kramer tells me he has changed the menu four times in three months, in part because it's a seasonal menu, but also because he wants to please his customers. When a diner asked why spaghetti wasn't on the menu, Kramer says, he decided "to make the best spaghetti and meatballs I can." Of course, as Kramer points out, he and his staff are just kids. I guess part of being a kid is trying to please your elders. And I have no doubt he makes damn good spaghetti and meatballs. But Kramer shows so much potential at Trattoria Two that I can't wait for his rebellious adolescence, let alone his adulthood.